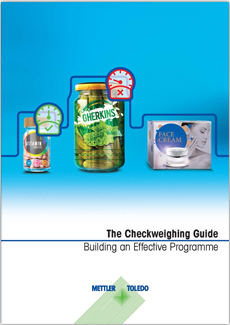 The Checkweighing Guide provides a comprehensive overview of how to use checkweighing technology as part of an effective quality assurance programme. Comprising everything from basic principles and Statistical Process Control (SPC), metrological regulations and developing an effective checkweighing programme to provide maximum customer and brand protection, the 15 chapters offer an insight into all aspects of in-line weighing technology. Increase productivity through waste reduction, Improve profitability and competitiveness through tighter tolerances and better product consistency.